From heaven to the earth, hiding in the flesh. Working among men, through winds and rains. Taking a rough path, open a new age. To redeem mankind, lay down Your life and shed blood. Wind and rain, so many years. Forsaken by every man. Humble and hidden, enduring all along. Humble and hidden, enduring all along. Sacrifice for Your will; this is my wish. Though flesh's in trials, stronger is my will. Love You more intensely; bitterness most sweet. Eyes blurred by tears, but my life is so bright. Broken and smashed time after time, care about Your will even more. Faithful till death, through thick and thin. Faithful till death, thick and thin. Going through pains, tasting hardships. Chastened and disciplined, reviving from death. Under Your care again, adore You all the more. Thinking of the past, great regrets in my heart. Broken and smashed time after time, care about Your will even more. Faithful till death, through thick and thin. Faithful till death, thick and thin. Heavy burden on, hesitate no more. Small stature as mine; thanks to Your love, my journey till today, experienced Your great love. Bitter and sweet, happiness with sorrows. Broken and smashed time after time, care about Your will even more. Faithful till death, through thick and thin. Faithful till death, thick and thin. Bestow Your mercy, pity my weakness. Unleash Your anger, curse my disobedience. Abundantly merciful, profoundly wrathful. Seen Your majesty, experienced Your wisdom. Broken and smashed time after time, care about Your will even more. Faithful till death, through thick and thin. Faithful till death, thick and thin. Live in Your love, offer myself up. Painful refining, all You predestined. To be perfected, fulfill Your commission, and satisfy Your heart; it's the life of mine. Sweets and bitters, I've tasted much. Hardships fill in my life. Suffering or bitterness, I won't complain. I won't complain till my life's end. 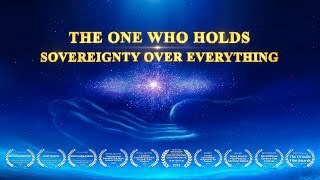 God Help Us | Gospel Music "God Is Seeking Your Heart and Your Spirit"
A Hymn of God's Words "All Things Exist Under the Authority of the Creator"